eBay Men Shoes Sneakers Motorsport Football Golf Sandals Boots Clothing T-Shirts Underwear Shorts & Bermudas Hoodies & Sweats Jerseys Pants Shirts Track Suits Jackets & Coats Swimwear Accessoires Caps & Hats Bags Belts Wallets Bagpacks Other Women Shoes Running Sneakers & Trainers Sandals Golf Sonstige Clothing Tops & Shirts Skirts Jackets Sweatshirts Shorts & Bermudas Pants Other Accessoires Caps & Hats Bags Bagpacks Other Kids Boys Shoes Clothing Accessoires Other Girls Shoes Clothing Accessoires Other THE OFFICIAL PUMA STORE Categories Sporting Goods Clothes, Shoes & Accessories Baby Color Beige Blue Brown Yellow Gold Grau Green Purple Mehrfarbig Nature Orange Pink Red Black Metallic White PUMA Astro Sala Men's Sneakers Men Shoe Basics New Schließen Weiter Schließen Weiter Zurück Schließen Weiter Zurück Schließen Weiter Zurück Schließen Weiter Zurück Schließen Weiter Zurück Schließen Weiter Zurück Schließen Weiter Zurück + PUMA Astro Sala Men's Sneakers Men Shoe Basics New Product details Sport and style come together with the Astro Sala, as its silhouette is designed after the indoor soccer cleat and its look features a classic, yet stylish PUMA look. Carry on, and bring sport with you. FeaturesSuede and mesh upperLace closure for snug fitRubber outsole for gripPUMA Formstrip at lateral and medial sidesPUMA Archive Logo label at tonguePUMA Cat Logo at heelSales Style Number:US362361 Sales Payment We only accept payments made by PayPal. PUMA reserves the right to cancel, without penalty, orders deemed to be placed by product resellers. Shipping FedEx SmartPost® - 6-9 business days - FREE FedEx Express Saver® - 3 business days - $12 FedEx 2Day® - 6-9 business days - $18 Returns PUMA and eBay are committed to your happiness; we offer free returns for customers in the continental U.S., Alaska, and Hawaii. 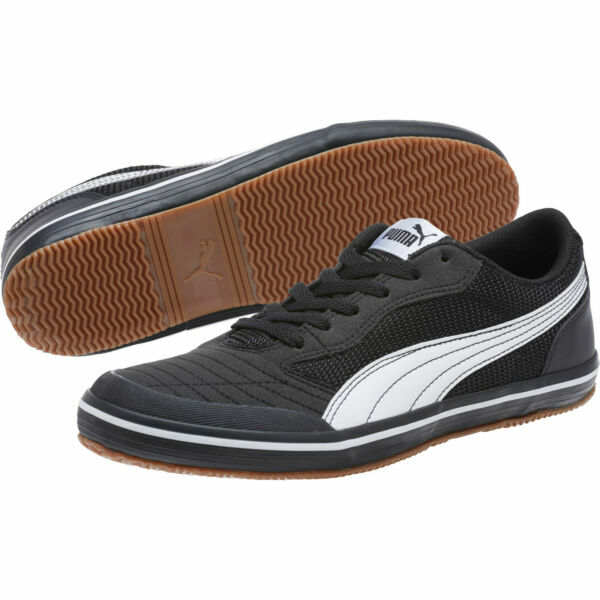 You may return PUMA products in their original, unused condition for a full refund of the merchandise value. Unless otherwise noted, we will gladly accept your return within 30 days of date of delivery. Please note: Final Sale merchandise -- noted as "Seller does not offer returns" in the eBay listing's "Returns" section -- is not eligible for return. Sports Soccer Running Training Golf PUMA ebay - Newsletter Sign up for the ebay newsletter and you will always be informed about our great offers and promotions. Newsletter Sign up ©2018 PUMA / All rights reserved.